The Vienna Philharmonic 1oz gold coin started being minted in 1989 and rapidly became one of the most beautiful coins around the world, its issuing still continuing today and it will remain so due to the manifested high demand. This massive success among investors and collectors stems from the high purity of the Vienna Philharmonic 1oz gold coin and another factor is its extraordinary design. The Vienna Philharmonic 1oz gold coin is issued by a mint that has been famous for its high standards for 800 years, the Austrian Mint in Vienna. For the Vienna Philharmonic gold coin there were issued four denominations: 1/10oz, 1/2oz, 1/4oz, and the last one is the one presented in this article the 1 troy ounce of gold. Being honored with the title of the best sold coin in 1992, 1995 and 1996, the Vienna Philharmonic 1oz gold coin owes much of its success to the 24 carats purity. It weighs 31.10 grams of 99.99% pure gold, being the only gold coin with a regular production and a denomination in euro. It is also the only coin that was featured on the side of an airplane. 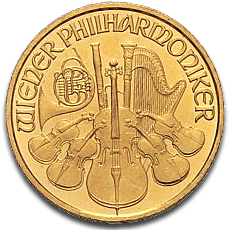 The obverse of the Vienna Philharmonic 1oz gold coin illustrates the image of different playing instrument so nicely engraved by designer Thomas Pesendorfer. Among these instruments are a cello, four violins, a Viennese horn, and a harp, all these instruments together are meant to symbolize the Vienna Philharmonic Orchestra which is also the name of this Vienna Philharmonic 1oz gold coin. In a semicircle at the top of the head side of the coin is inscribed WIENER PHILHARMONIKER. The reverse of the Vienna Philharmonic 1oz gold coin depicts the Great Organ which is where concerts are performed by the renowned Orchestra from the Vienna Philharmonic. The legend reads REPUBLIK OSTERREICH together with the weight 1/10 ONZE GOLD 999.9 and the minting year. In the case of the coin displayed on our website is inscribed 1995. At the bottom is inscribed the denomination of 200 SCHILLING since it was a Vienna Philharmonic 1oz gold coin minted before the introduction of the euro. In euro the denomination is 100 euro. The Vienna Philharmonic 1oz gold coin can be a little too pricy for some investors, especially for the inexperienced ones. Those can start first with the smaller denominations and then they will discover the excitement of owning such a sought after coin. When the gold spot price increases, this Austrian coin can turn out to be really profitable. The older a Vienna Philharmonic 1oz gold coin becomes, the more valuable it is because as years pass there are not so many coins in good condition available. So their premium increases since demand far exceeds supply. This Austrian coin so characteristic for this highly cultural country is available on our website from a range of different years. If an investor or a collector desires to trade the Vienna Philharmonic 1oz gold coin issued in 2012, the respective individual will find it on our website.